We are now seeking industrial partners with problems to solve for the academic year 2018/19. This is an opportunity for your company to get some external input from enthusiastic and intelligent Oxford Physics undergraduates. In return, our students learn how their physics training can be applied in industry. The mystery of how comets are able to emit X-rays has been solved by a team led by the University of Oxford. The research published in Nature Physics considers the longstanding scientific question of how comets are able to radiate X-rays. A conundrum that is particularly puzzling, given that such emission is normally associated with very hot objects like the Sun, and comets are among the coldest objects in the Solar System. On 13 March 2018, physicists awoke to news that Prof Stephen Hawking, surely Oxford’s best known physics undergraduate (Univ. 1959), had died peacefully in his sleep. He leaves behind a monumental legacy. Congratulations to three MPLS academics who have been appointed as members of the new UK Research and Innovation Councils, which will replace the existing Research Councils on 1 April 2018 when UK Research and Innovation (UKRI) is formally established. Oxford Physics will participate for the first time in the Oxfordshire Artweeks and will exhibit art work by members of the Department on the 12.05/13.05 and 18.05.2018 in the Beecroft Building. The Oxfordshire Artweeks is an annual event that showcases art pieces around Oxfordshire in people’s homes and community centres or other venues. The Access and Academic Affairs team at Oxford Student Union launched a project this academic year to try to encourage and support students who get involved in access work throughout the Collegiate University. 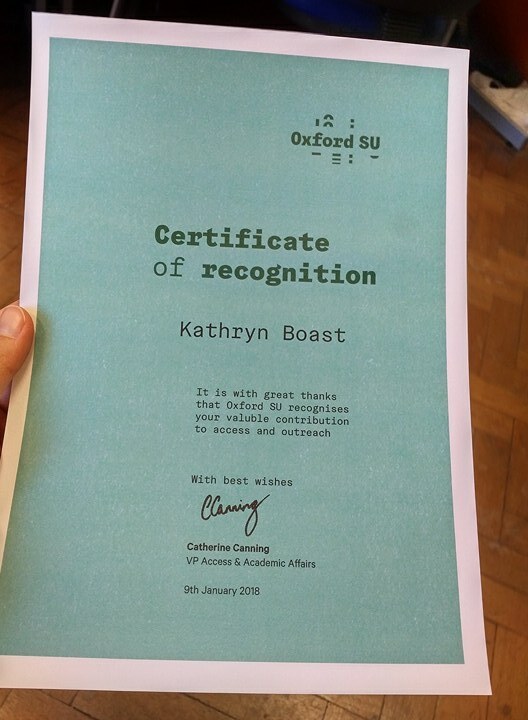 As part of this project they awarded certificates of recognition alongside a letter of thanks to students who have made a contribution to access and outreach at Oxford. Researchers have discovered that input-output maps, which are widely used throughout science and engineering to model systems ranging from physics to finance, are strongly biased toward producing simple outputs. The results are surprising, as naïvely there is no reason to suspect that one output should be more likely than any other. Researchers Vera Schäfer and Dr Chris Ballance in Professor David Lucas's group have set a new speed record for the 'logic gates' that form the building blocks of quantum computing – a technology that could transform the way we process information. Congratulation to Dr Kerri Donaldson Hanna who has been awarded the 2018 Winton Award for Geophysics by the Royal Astronomical Society. Professor Walmsley took up the role of President of the Optical Society of America (OSA) on 1st January this year, having been elected to the role of Vice-President in 2016.